Nautique boats have been around for about 40 years. The company takes pride in using the highest-quality materials in the making of these boats. Their goal is to provide the highest level of comfort to their customers. The manufacturer and design team has efficiently come up with a user-friendly approach to feature each boat so that it can be of utmost advantage to the user. The Nautique 40 Open is one of them where the owner can truly relax their days on the boat. You want to make sure your nights are also as relaxing as your days on such a luxury boat. Sleep is essential for a person’s health and well-being according to the National Sleep Foundation. Despite of this fact, there are only a few people who actually know the importance of a good quality mattress and how is it related to have a good night sleep. 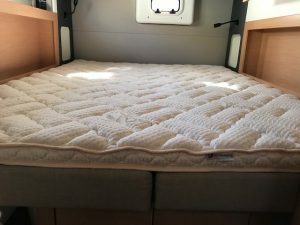 Picking out the right mattress for your boat is as crucial as having one for your home and that’s why it should be on the top of your list to improve your sleeping quality on your boat. Unfortunately, with hundreds of options out there, the process can be really frustrating and stressful. At Yachtbedding.com, we keep it simple so you can enjoy the comfort without any stress. We specialize in latex. Simply, because of its amazing qualities; bendable, breathable, mold and mildew resistant, will not absorb smells and sleeps cooler than warmer. Visit our website and click on our mattresses and it is all there for you. Three simple options to choose from. 7” commodore constructed with a 6″ Latex core and covered in an ultra-soft bamboo quilting. 9” Admiral made with a super comfy 6” latex core and we then add 2” of ultra-soft latex pillow top and cover it in the plushest of bamboo quilting. And lastly our 6” Hybrid constructed with a 3” base of hi density polyurethane foam and we add 2 inches of soft latex and cover it in our plush bamboo quilting. 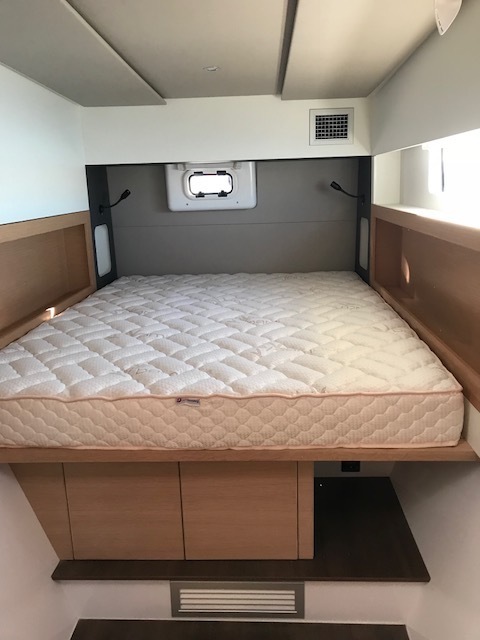 The pictures show our mattress in the Master of this Nautique 40 open and we used toppers for the guest cabins. 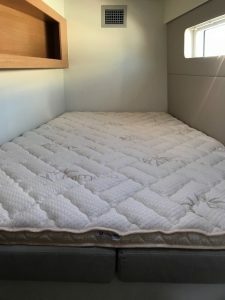 All of our toppers are made using a 2” layer of soft latex thick to provide a plush layer of comfort and are made from the same materials as our mattresses. Feel free to contact us if you have any further inquiries regarding our mattresses, sheets or bedding so we can help. Our ultimate goal is to keep the selection process for our clients as simple as can be so you are ready in no time to have your dream statement room and enjoy your nights as much as your days on your boat.